WorldHost customer service training has been used to train over 160,000 people in the UK. Their aim is to transform customer service standards across the UK, and build the nation’s reputation as one of the most welcoming tourist destinations in the world. WorldHost’s “Principles of Customer Service” course is a one day course aimed at businesses in Moray which have front of house staff for example tourism and hospitality. Once completed, the certificate is awarded to the individual and it is transferable should they change employment. If a business chooses to train 50% of it’s staff through WorldHost, they will become a WorldHost Accredited Business. This will benefit them in a number of ways including listing on the WorldHost website, repeat customers and satisfied customers. The course usually costs £95 per employee, but Moray have agreed a reduction to £75. Some businesses can benefit from funding towards this through Skills Development Scotland and as such this £40 funding can bring the cost down to just £35 per employee. 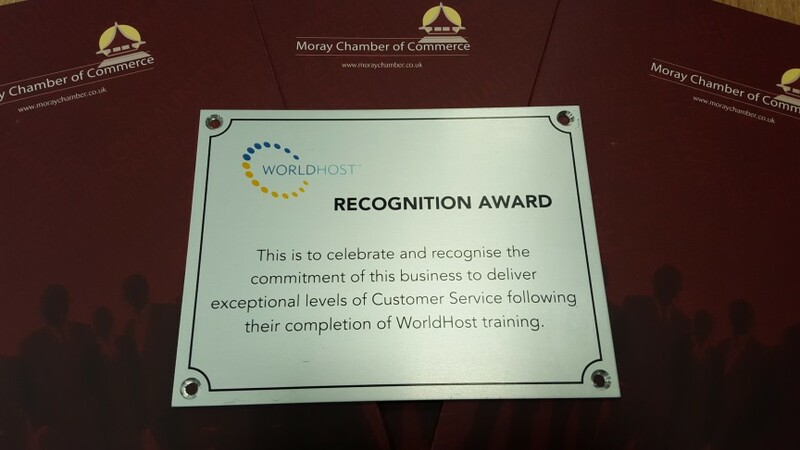 Moray as a whole are looking to aim towards becoming a WorldHost Recognised Destination so visitors can be confident of the level of service that they will receive when visiting the area. This can only happen if 25% of qualifying businesses receive their accredited business status. If you would like more information on this, contact Sarah on smedcraf@moraychamber.co.uk / 01343 543344 and she will advise you of the relevant WorldHost representatives in Moray.